What to do with unused, rusting trolley tracks across the Deerfield River? In 1928 Antoinette Burnham envisioned a blooming bridge, and through the efforts of the Shelburne Falls Women’s Club and others, the Bridge of Flowers was opened to the public soon afterwards, spanning the Deerfield River between Shelburne Falls and Buckland, Massachusetts. It continues to enchant visitors to this day. 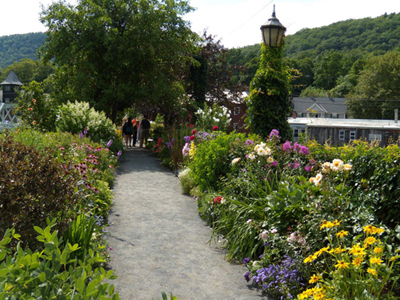 The Western Massachusetts Master Gardeners got involved several years ago. We act as docents on the Bridge, answering visitors’ questions, from “how did this get created”, “who waters it”, and especially, “what are those beautiful red flowers over there?” Maintained by the “Blossom Brigade”, a group of volunteers, the Bridge is open from April through October, with an ever-changing cascade of flowers festooning the gardens along the central path. Visitors come from every state and over 90 countries, with over 29,000 people signing the guest book last year. You never know who you might meet and chat with, and the Bridge is a beautiful, fragrant setting in which to “work”. We volunteer on weekends and holidays from Memorial Day through Columbus Day weekend, usually for 3 hours in the middle of the day when the most people visit. While farther north than most of our other MG venues, the towns of Shelburne Falls and Buckland are enticing places to have a meal or explore the many small shops and artist galleries while you are there.